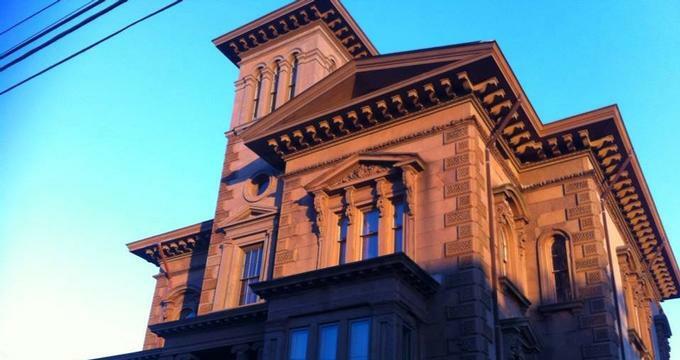 Portland's Victoria Mansion is a pre-civil war architectural gem, near the heart of the downtown area. Exemplifying the opulence that characterized the era, the over the top embellishments are a must-see on a trip to Portland, Maine. The Mansion has been restored to a high level, complete with period specific furnishings transporting visitors back in time. 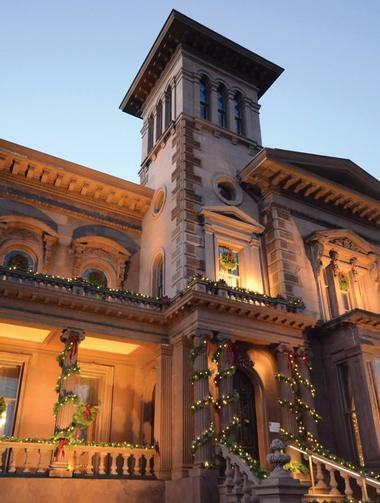 The holidays are an especially good time to visit the landmark, as the Mansion is trimmed from top to bottom in elaborate Christmas decorations, adding to the magnificence and majesty of the interiors. Construction began on the Mansion in 1850, lasting for a full decade and finishing in 1860, just a few years before the start of the Civil War. Originally known as the Morse-Libby House, it was built as a summer home for Russel Sylvester Morse. Morse was a native of the state of Maine, but built his fortune in luxurious New Orleans hotels. Upon Morse's death in 1893, the house was sold to a prominent merchant, J.R. Libby. The Libby family lived in the Mansion for more than three decades, preserving the house and its original decor. A massive 1938 hurricane damaged the structure, and by 1940 was listed for demolition. Good fortune found the house at this precipice, in the form of Dr. William H. Holmes, who purchased the Mansion with the intension to rescue it from its dire fate. With the help of his sister Clara Holmes, they restored the building, dedicating it to Queen Victoria, for whom it is now named. In 1941, the siblings opened the Mansion to the public. A few short years later, the Society of Maine Women of Achievement was created and took control of the site. The Victoria Mansion continued to operate through the non-profit organization, Victoria House, Inc. for many decades, and received its historical designation in 1970. The Italianate architecture that characterizes Victoria Mansion was extremely fashionable during the mid-1800s. The work of its architect, Henry Austin, was well suited to this style of structure. Using a mixture of balconies and piazzas, combined with the square tower helped to create a city meets country aesthetic that was perfectly suited to the summer Mansion. The exterior is comprised primarily of Connecticut brownstone, working with materials of the northeast, while evoking the style of southern Europe. Conservation of the architecture is a major focus for Victoria Mansion, Inc., which has undertaken significant renovation and restoration efforts over the years. At the turn of the millennia, the Mansion received the Save America's Treasures Grant of $1.4 million, to help make needed restorations, particularly to the structure's tower. For the elaborate interior decorations of the house, Morse enlisted German-trained Gustave Herter. Herter, having immigrated to New York several years earlier, was a notable interior designer through the pre-civil war era. Despite his influence, the Victoria Mansion is the only full commission of his work that remains intact today. Thanks to the Libby family's preservation through their decades of ownership, much of the original interior remains. Because of this conservation, and the ornate and richly gilded style of decoration, the Victoria Mansion is today one of the finest examples of pre-civil war grandeur in the country. For example, the Mansion exhibits fine specimens of the tromp l'oeil technique on ceilings and walls. These murals, executed by Giuseppe Guidicini, fool the eye in interesting ways and are one of the best features of the Mansion. The original plans and construction of the home incorporated hot and cold running water, central heating, gas lighting and servants' bells. These features, considered the height of technology at the time, made the home the most modern house in all of Maine upon its completion. With its well-preserved and richly decorated examples of pre-civil war rooms, the Victoria Mansion is a destination for education about that period in American history. Guided toursat the Mansion make history come alive, as visitors walk right into life in the 1860s. Specific programs targeted to different age groups from toddlers to graduate students are available with coordination from the Mansion's education director. Also on offer is an interdisciplinary program that includes lessons, bringing a Mansion expert to the classroom for historical talks and discussion prior to a Victoria Mansion field trip. With different lessons to choose from, educators can select the best option for their class. In addition to school outreach programs, Victoria Mansion also offers lectures, talks and events to illustrate the history of the Mansion. These often focus on a variety of nineteenth century themes, and are designed for adult audiences. In addition to the variety of educational programs available at the Mansion, special events also bring life to the historic building. Themed tours, such as Restoration at the Mansion, take an in-depth look at the structure's long past. Other, even tastier events, such as Allagash Victoria Ale Premier, or Croquet day andBYO Picnics, create a fun and interactive time. Music and movies also enliven the Mansion, and include such events as Opera at the Mansion and Movies at the Mansion, which showcases classic films on the lawn. Seasonal events can include Halloween masquerades or other holiday happenings. With such an array of events to entertain, there is always something fun to do at Victoria Mansion. Located just a short walk, drive or bus from the heart of Portland, the Victoria Mansion is easy to incorporate into a day downtown. Street parking is available in the surrounding area; however, there is no on-site parking. Tours are available with admission certain days of the week. Visitors are recommended to check the Mansion's website for tour information, hours and ticket prices. 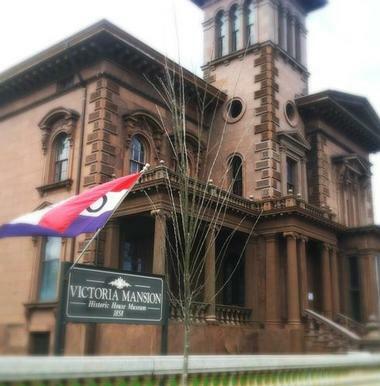 With unique events, beautiful décor and history that practically comes to alive, the Victoria Mansion is a fine way to spend an afternoon.